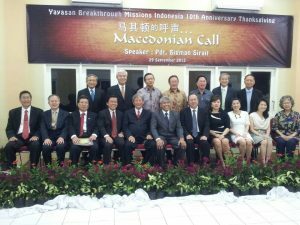 At that time, our evangelistic team led by Pastor Simon Neo, visited over 8 cities in East and West Java. Pastor Simon’s sharing of his life’s transformation and anti-drug vision were well-received as it was easy to see the damage caused by drugs and the resulting societal problems such as broken families, crime, suicides, drug trafficking and AIDS, etc. In 2000 by God’s divine purpose, our Indonesian brother Kumia returned to Bandung after training with us and started sharing the anti-drug vision to churhes in Indonesia. Many churches responded to the vision and reached out to drug addicts. A church called “Hok Im Tong” rented a space and started Bandung Breakthrough Missions. Praise the Lord! The gifts of love to God’s ministry from the Lippo Group and from the brothers and sisters from churches in Jakarta and Bandung are indeed delightful and pleasant offerings unto God and blessings unto many; accomplishing God’s redemptive plan for the lost. Ever since then, we have been sending our staff and residents to pioneer the ministry work in Jakarta. Glory be to God!